Blood programs are done differently in different grand jurisdictions, but almost all jurisdictions have some sort of plan or another. Here in Virginia, it is a point-based system, run on the district level, with the individual lodges getting credit for their members donating. One point for each whole blood donation, two for double reds, 10 or 20 points for each apheresis donation. After so many points are accumulated, the lodge wins an award for being an excellent donor organization. Another plaque to hang on the wall of the social hall where the brothers gather for a fine repast is great, but the real reward is knowing that you might have have saved a life. Each pint of blood can be used for three different people. Your 20 minutes in the chair can help save three lives. If that isn’t powerful, I don’t know what is. The Red Cross has strict guidelines on blood they can receive because they try to standardize the product for use all over the world. However, your local blood bank is likely less restrictive. Give where and when you can. Even if you do not qualify as a donor for the Red Cross, they can use your blood for research, so any blood donation goes to a good cause. Me, I try to donate locally, as the Red Cross told me to go pound sand due to having had mono. Hasn’t everyone had mono? Anyway, my local hospital-based blood center is glad to have me come. If you have not given blood, make an appointment today. Save a life while you can, and pray that you never need a donation. Last night I had the pleasure of watching a good friend be initiated at Solomon’s Lodge No. 121 in Savage, MD. What a great group of brothers I got to be with! They are a fun crowd but are serious about their work, while still having great fraternal relations. It definitely made me feel good about bringing my friend there. Watching him walk the floor and experience the degree for the first time brought me back to the beginner’s mind, reminding me of my own EA degree. I was a bit hesitant, not knowing what was going to happen or really what I was getting into. I recently read two things that are true. 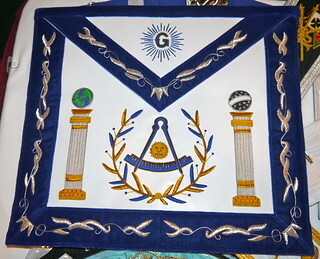 The first was that there is no degree higher than that of Master Mason. The other was that the degree that should be most celebrated is that of Entered Apprentice. That is when we welcome a brother into the order and make him a Mason, even if it is a lower degree. He is still a brother and should be honored as such. I wrote this piece about how experiences as a Freemason helped me in my professional career. When you work in the membership-based organization business, a Masonic lodge can give you a different perspective on some things. In my case, it helped me earn a valuable professional credential. I sometimes hear negative talk about “title hunters” – those members who seem to want to collect all the fancy titles they can. They volunteer and ask for leadership roles and seem to want to be the head of everything for some time. You have met them. You know who I am talking about. Personally, I have no problem with title hunters. As long as they are doing the work to earn the title, who cares what their motivations are? If they can work for their own egos and support the lodge or whatever body they are head of, and make it a better organization, their mercenary motives are not really that interesting to me. However, I think we need to get back to all being brothers, rather than seeing the gradations of titles as class separators. Some of the newer brothers do not feel like they belong on the same row of seats as the seasoned old-timers who hold more titles than Carter had liver pills. And, to be honest, I have known some old-timers with lots of titles who mostly seemed interested in associating with their similarly titled colleagues, rather than with the rabble and riffraff. This isn’t how titles are supposed to work. The are supposed to reward a job well done, not be a barrier to social interaction. None of us is a higher rank than Master Mason; we should not create divisions where there are none. Do we even need all these fancy titles? Those of us who can’t help but swallow the hook and be part of yet another organization tend to accumulate titles left and right, but really we are no higher than the title of Brother. Let’s get rid of the fancy titles, huh? We meet on the level, right? Shouldn’t we dispense with all the formalities and ego-boosting trappings? You have to ask yourself something. For whom did you work? Was it for yourself, for your ego, or for your brothers and the lodge? If you perform selfless work, being rewarded is not much of an issue. If you perform work to stoke your ego, maybe not keeping the fancy title is a good lesson.